Photo @ LachlanVe: Terrorist or victim? 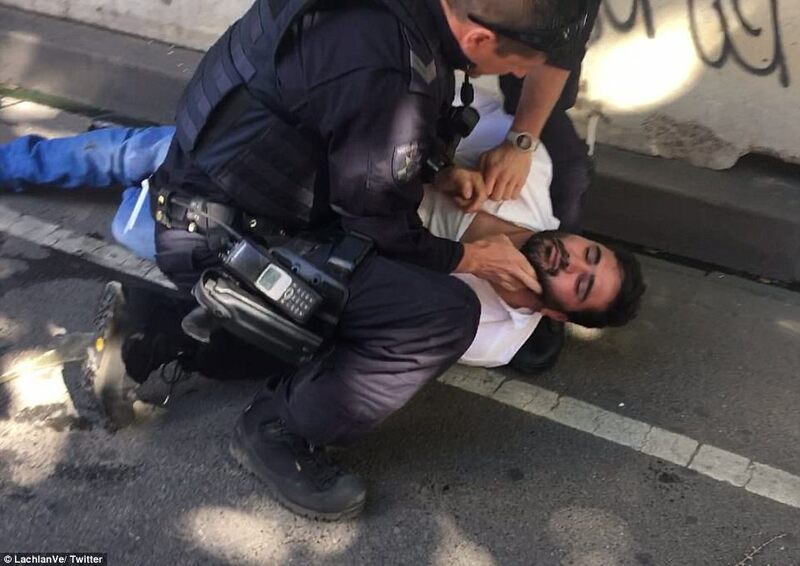 This is a terrorist attack by any other name, after his arrest Noori blamed his cowardly action on Australia's 'poor treatment of Muslims'. And surely if he is a drug addict why was he not deported back to the hell-hole he came from? Saeed Noori, the driver behind the wheel of the SUV, arrived in Australia as a refugee in 2004 through a resettlement program. 'He came to Australia as a refugee from Afghanistan. The Oxford Dictionary describes terrorism as 'the unlawful use of violence and intimidation, especially against civilians, in the pursuit of political aims,' which is exactly what happened yesterday, but once again the 'establishment' wallowing in political correctness lovleyism and apologetic toward the minority are trying to brush this heinous act under the carpet as they protect this monster above the 19 innocent Australians laying in hospital...Shame on you Australia, shame on you too European Union who are also guilty of trying to pull the wool over our eyes by protecting Islam from terrorism in any way they can as these mad dogs roam our western cities looking for innocent victims. Anyone who practices Islam is insane to me but the left is spineless and dumb as a stump. Yes, like a petrified one (stump)at that! Jesus, what idiots ! You don't have to have affiliates to be a terrorist. All you have to have is intent to do harm. Just being a Muslime does not automatically make you a terrorist, but anyone who wants to hurt others in mass, IS !!! DUH ! What the hell is the matter with you idiots down under ?? Nobody cares if he was drug addled or even nuts, if he ran into a crowd of people regardless of his mental state, HE IS A FUQUING TERRORIST. YOU PEOPLE REALLY DO NEED TO GET YOUR HEADS OUT OF YOUR COLLECTIVE ASSES !!! Not everyone in Australia thinks he i'snt a terrorist - just the government... That's their BIG plan to Islamify Australia which is occurring at a very great pace - and now the UN wants them to release all the prisoners on Manus Island - for what? More attacks of course! We're on to it buddy,our two major political partys take huge amounts of money from the Islamic Community and are afraid to call them out. Islam itself is insane. No one with any self-respect or respect for life would embrace islam. Islam is a spiritual travesty. It can only spread by terrorism. Stupid barbarian males join because it gives them permission to be total assholes. Women join from fear. a person who uses unlawful violence and intimidation, especially against civilians, in the pursuit of **** political aims ****. Please stick to science instead of uninformed, political commentary happening in a foreign country. Your byline is "Geophysics On Steroids" not "Right Wing Sensationalism." Since I am not the latter, it must be the former. What can one expect from someone that uses "demon-possessed monster" in a headline, and hurls insults by insinuating I am dull between my ears. Since you are so informed as to what this person was up to, what exactly was his political agenda? Or do you just paint everyone of any given group with the same paintbrush? Using your logic, all Roman Catholic men are paedophiles. Thankfully, people that share your view of the world are in the minority. Sadly, they are extremely vocal and active. The above comment was a reply to Mr. Walton's opinion/comment which has been deleted. They would also encourage their dog to learn to understand what dogs to approach and what not to. Knowing this implicitly because of their vast experience with random dogs in dog parks. What to do when another dominating dog comes over that they don't want to engage with, but they dont want to encourage a bite either (ie getting your dog to the social state that they dont go automatically into fight or flight mode).